How Many Irmas in 2100? We get a lot of readers sent to us from European sceptic sites, for example http://www.staatvanhetklimaat.nl/ which is in Dutch, and which I recommend strongly to anyone who thinks they’re not gifted for languages. Just read it aloud with a Norfolk accent, and you’ll get the gist. This article is from our French sister site Skyfall. It’s by Nicias, and I reproduce my translation, with his permission. The original is here. I couldn’t help it. Yesterday I switched on the tv and an “expert” looked me straight in the eye and asserted that these cyclones in the Atlantic were all the fault of global warming. But what does the IPCC say? – OK guys, never mind the text, nobody’s going to read it. We need an image. – And statistics. We have to quantify. We’re doing science. – You’re right. It’s got to be clear, with a median and a 66% confidence interval as required by the report guidelines. – What does the literature say for the projections to 2100? How big is the increase for category 4 and 5 hurricanes? – It says we don’t know. – Tom K. wants a number if you want to hold on to your budget. To your calculators guys, you’ve got 5 minutes. – So Kerry, what’s the upper limit of the forecasts? – Plus 200.04%. We could round it down to +200%. – Paul, the lower boundary? – What”s the lowest estimate? – I’m not going through the calculations again! – Oka-ay. You’ve got the imprint of your keypad on the left cheek. – It’s jet lag. I was at a conference in Miami yesterday. – OK. So we’ll round it up to minus 100%. For the “best guess”, we only have to average. 200 minus 100. I divide by 2, this gives us + 50%. In any case we need a positive value, otherwise we’re going to have to discus droughts caused by the lack of cyclones, and there”s no more space in our chapter. – At least, with a range like that, we can hardly be wrong. Done. Thanks guys. Now I have to fetch my wife at Honolulu airport. 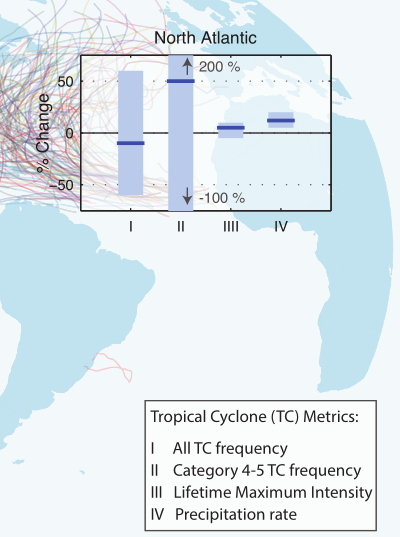 Just as seriously, the IPCC tells us that globally the number of major cyclones will increase, but we don’t know where. Not in the Northern Hemisphere (“insufficient data”), nor in the Southern Hemisphere. So it is elsewhere (on the Oceanus Procellarum?). The embarrassing thing is that the IPCC knew all this at the time of AR4, and the media believed them. We all make mistakes. But in AR5, they no longer know, but they can’t bring themselves to say so. Tags: IPCC, science, Skyfall. Bookmark the permalink. Although Irmas are nature’s way of “rolling a thirteen,” and climate change uses “steroids” to “load the dice,” it is impossible to attribute any one specific Irma to global Irming, stress today’s latest scientists. We simply have to resign ourselves to the post-natural, Anthropocene reality: these one-per-billion-year phenomena are now the new Irmal. At least human lives aren’t at stake. That’s something. Sounds like a fine application of the Delphi technique to me. What are you guys (and fair ladies?) bitching (or dogging) about? You bring the world’s best experts together, give them a totally (un)reasonable final deadline, feed them pizza and get the most accurate guesstimates that money and Sloppy Giuseppe can buy. This product will naturally be tortured beyond recognition by the state-sponsored politicos (who will be fed steak tartare to keep their strength up). Yet despite this intensive, mutistage vetting procedure you express doubts. Geeze, is there no satisfying you? Big oil sponsored denial has much to answer for. Remember folks they are only 3% and will be ignored. More than one Irma in 2100: that indeed would be Irmageddon! wouldn’t it violate the laws of Irmodynamics?